1 A None No Power Seat 1 A is a standard Economy Class seat that may have limited legroom due to the bulkhead. There is no floor storage for this seat during takeoff and landing. The tray table is in the armrest, making the armrest immovable and slightly reducing seat width. 1 B None No Power Seat 1 B is a standard Economy Class seat that may have limited legroom due to the bulkhead. There is no floor storage for this seat during takeoff and landing. The tray table is in the armrest, making the armrest immovable and slightly reducing seat width. 1 C None No Power Seat 1 C is a standard Economy Class seat that may have limited legroom due to the bulkhead. There is no floor storage for this seat during takeoff and landing. The tray table is in the armrest, making the armrest immovable and slightly reducing seat width. 11 A None No Power Seat 11 A is a standard Economy Class seat that is missing a window. 11 F None No Power Seat 11 F is a standard Economy Class seat that is missing a window. 12 A None No Power Seat 12 A is a standard Economy Class seat that is missing a window. 12 F None No Power Seat 12 F is a standard Economy Class seat that is missing a window. 14 A None No Power Seat 14 A is a standard Economy Class seat that has limited recline due to the Exit Row behind. 14 B None No Power Seat 14 B is a standard Economy Class seat that has limited recline due to the Exit Row behind. 14 C None No Power Seat 14 C is a standard Economy Class seat that has limited recline due to the Exit Row behind. 14 D None No Power Seat 14 D is a standard Economy Class seat that has limited recline due to the Exit Row behind. 14 E None No Power Seat 14 E is a standard Economy Class seat that has limited recline due to the Exit Row behind. 14 F None No Power Seat 14 F is a standard Economy Class seat that has limited recline due to the Exit Row behind. 15 A None No Power Seat 15 A is a standard Economy Class seat that has extra legroom due to the exit in front however, also has limited recline due to the exit row behind. There is no floor storage for this seat during takeoff and landing. The tray table is in the armrest, making the armrest immovable and slightly reducing seat width. 15 B None No Power Seat 15 B is a standard Economy Class seat that has extra legroom due to the exit in front however, also has limited recline due to the exit row behind. There is no floor storage for this seat during takeoff and landing. The tray table is in the armrest, making the armrest immovable and slightly reducing seat width. 15 C None No Power Seat 15 C is a standard Economy Class seat that has extra legroom due to the exit in front however, also has limited recline due to the exit row behind. There is no floor storage for this seat during takeoff and landing. The tray table is in the armrest, making the armrest immovable and slightly reducing seat width. 15 D None No Power Seat 15 D is a standard Economy Class seat that has extra legroom due to the exit in front however, also has limited recline due to the exit row behind. There is no floor storage for this seat during takeoff and landing. The tray table is in the armrest, making the armrest immovable and slightly reducing seat width. 15 E None No Power Seat 15 E is a standard Economy Class seat that has extra legroom due to the exit in front however, also has limited recline due to the exit row behind. There is no floor storage for this seat during takeoff and landing. The tray table is in the armrest, making the armrest immovable and slightly reducing seat width. 15 F None No Power Seat 15 F is a standard Economy Class seat that has extra legroom due to the exit in front however, also has limited recline due to the exit row behind. There is no floor storage for this seat during takeoff and landing. The tray table is in the armrest, making the armrest immovable and slightly reducing seat width. 16 A None No Power Seat 16 A is a standard Economy Class seat that has extra legroom due to the exit row. There is no floor storage for this seat during takeoff and landing. The tray table is in the armrest, making the armrest immovable and slightly reducing seat width. 16 B None No Power Seat 16 B is a standard Economy Class seat that has extra legroom due to the exit row. There is no floor storage for this seat during takeoff and landing. The tray table is in the armrest, making the armrest immovable and slightly reducing seat width. 16 C None No Power Seat 16 C is a standard Economy Class seat that has extra legroom due to the exit row. There is no floor storage for this seat during takeoff and landing. The tray table is in the armrest, making the armrest immovable and slightly reducing seat width. 16 D None No Power Seat 16 D is a standard Economy Class seat that has extra legroom due to the exit row. There is no floor storage for this seat during takeoff and landing. The tray table is in the armrest, making the armrest immovable and slightly reducing seat width. 16 E None No Power Seat 16 E is a standard Economy Class seat that has extra legroom due to the exit row. There is no floor storage for this seat during takeoff and landing. The tray table is in the armrest, making the armrest immovable and slightly reducing seat width. 16 F None No Power Seat 16 F is a standard Economy Class seat that has extra legroom due to the exit row. There is no floor storage for this seat during takeoff and landing. The tray table is in the armrest, making the armrest immovable and slightly reducing seat width. 2 D None No Power Seat 2 D is a standard Economy Class seat that TUIfly designates as having extra legroom. An extra surcharge may be required to book this seat. There is no floor storage for this seat during takeoff and landing. The tray table is in the armrest, making the armrest immovable and slightly reducing seat width. 2 E None No Power Seat 2 E is a standard Economy Class seat that TUIfly designates as having extra legroom. An extra surcharge may be required to book this seat. There is no floor storage for this seat during takeoff and landing. The tray table is in the armrest, making the armrest immovable and slightly reducing seat width. 2 F None No Power Seat 2 F is a standard Economy Class seat that TUIfly designates as having extra legroom. An extra surcharge may be required to book this seat. There is no floor storage for this seat during takeoff and landing. The tray table is in the armrest, making the armrest immovable and slightly reducing seat width. 3 D None No Power Seat 3 D is a standard Economy Class seat that TUIfly designates as having extra legroom. An extra surcharge may be required to book this seat. 3 E None No Power Seat 3 E is a standard Economy Class seat that TUIfly designates as having extra legroom. An extra surcharge may be required to book this seat. 3 F None No Power Seat 3 F is a standard Economy Class seat that TUIfly designates as having extra legroom. An extra surcharge may be required to book this seat. 31 C None No Power Seat 31 C is a standard Economy Class seat whose proximity to the lavatories may be bothersome. 31 D None No Power Seat 31 D is a standard Economy Class seat whose proximity to the lavatories may be bothersome. 32 A None No Power Seat 32 A is a standard Economy Class seat that may have limited recline and whose proximity to the lavatories and galley may be bothersome. 32 B None No Power Seat 32 B is a standard Economy Class seat that may have limited recline and whose proximity to the lavatories and galley may be bothersome. 32 C None No Power Seat 32 C is a standard Economy Class seat that may have limited recline and whose proximity to the lavatories and galley may be bothersome. 32 D None No Power Seat 32 D is a standard Economy Class seat that may have limited recline and whose proximity to the lavatories and galley may be bothersome. 32 E None No Power Seat 32 E is a standard Economy Class seat that may have limited recline and whose proximity to the lavatories and galley may be bothersome. 32 F None No Power Seat 32 F is a standard Economy Class seat that may have limited recline and whose proximity to the lavatories and galley may be bothersome. 4 D None No Power Seat 4 D is a standard Economy Class seat that TUIfly designates as having extra legroom. An extra surcharge may be required to book this seat. 4 E None No Power Seat 4 E is a standard Economy Class seat that TUIfly designates as having extra legroom. An extra surcharge may be required to book this seat. 4 F None No Power Seat 4 F is a standard Economy Class seat that TUIfly designates as having extra legroom. An extra surcharge may be required to book this seat. 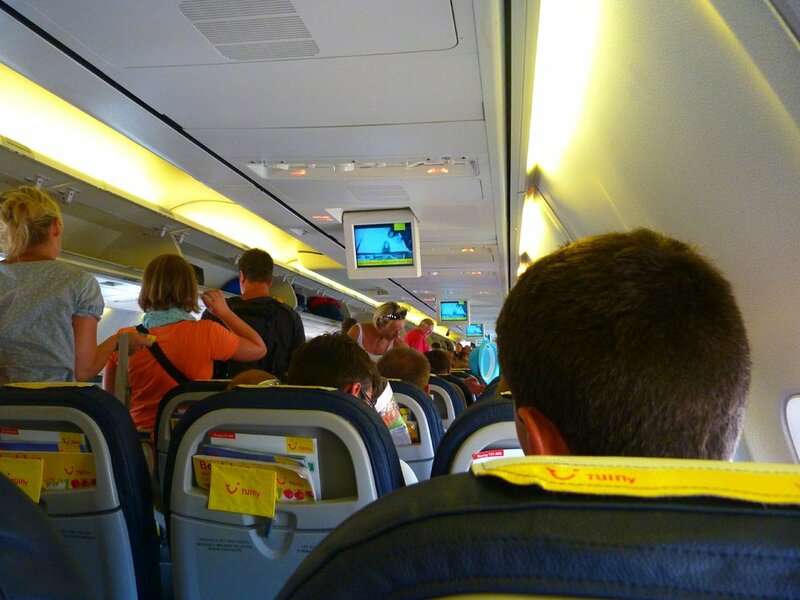 On flights within Germany and flights between Germany and Austria, Croatia, France, northern Italy, Sweden, Switzerland, and the United Kingdom TUIfly sells drinks and snacks. You can reserve a seat up to 48 hours before departure on payment of a non-refundable processing fee of EUR 9/GBP 7,00/USD $14, either when you book your flight online or afterward by calling the Service Center. Customers who book with a TUI Card/Flex-Rate can reserve a seat free of charge. On many flights, you can book an XL seat at the emergency exit for a charge of EUR 30/GBP 20/USD $40 per person per flight segment. Nice legroom, very narrow though. Good recline. A wall in front, but no discomfort of the nearby toilets. Nice calm seat with a good recline and extra legspace. Seat is very narrow though. 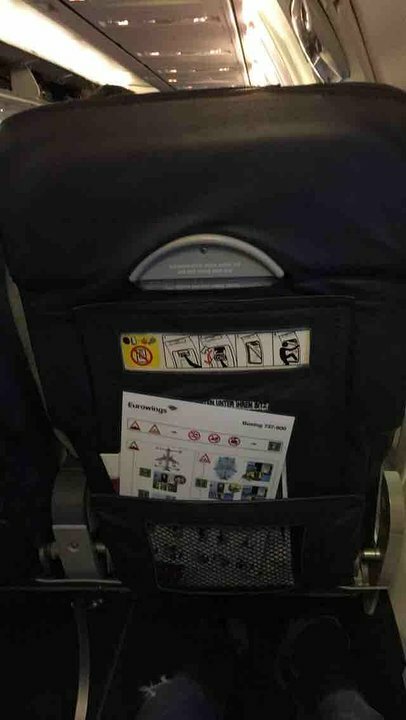 I booked Eurowings with extra legroom,but then it was operated by tuifly and seat 10A is in this Aircraft the worst you've ever seen,so tight and no window,4 hours flight and starring on a plastic panel all the time Avoid flying with tuifly !!! Extra legroom seat as are 1-4 however row 6 is not and due to Tui seats not habing a hard interior you can feel the knees of the passenger behind. There seemed to be an Entertainment box under seat 19 E which results in less space for your legs when you have 20 E.
Very bad: Just behind the crew resting places: the whole flight a curtain in your face. No place under the front seat for hand bagage, also no overhead place for the hand bagage (for crew and a dingy). Payed a lot extra for the legroom, but there wasn't any. Extremely small legroom and narrow seats. If the passenger in front of you decides to recline his/her seat, you're left with the choice of either not to move at all anymore since the seat goes right into your face, or recline your own seat too and shift the issue to the next row. 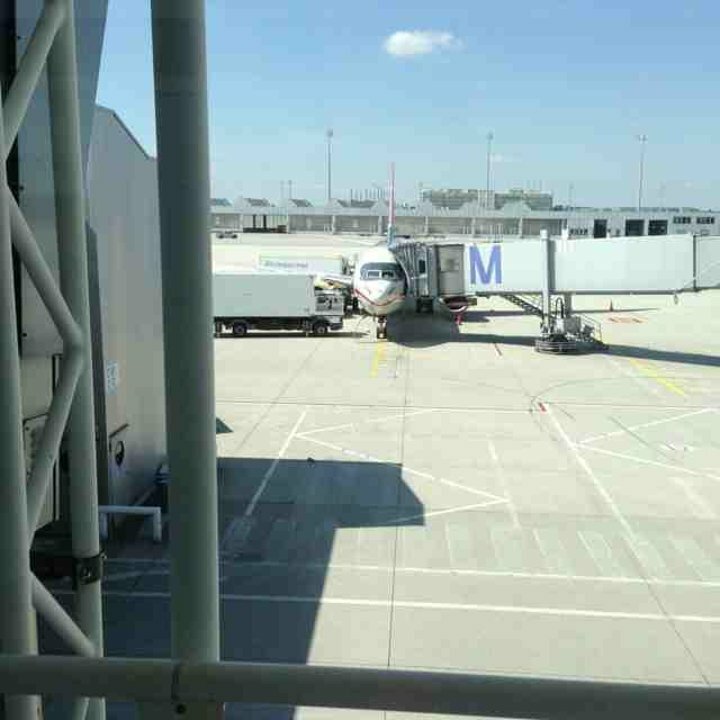 On the plus side, the overhead compartments seem somewhat larger than on older 737s or comparable Airbus planes. Even though the flight was fully occupied and (as usual) 80% of passengers seemed to carry their entire residence contents as hand luggage, nobody was forced to stow anything under the front seat as much as I could see. The seats are too small and legspace rediculous short. 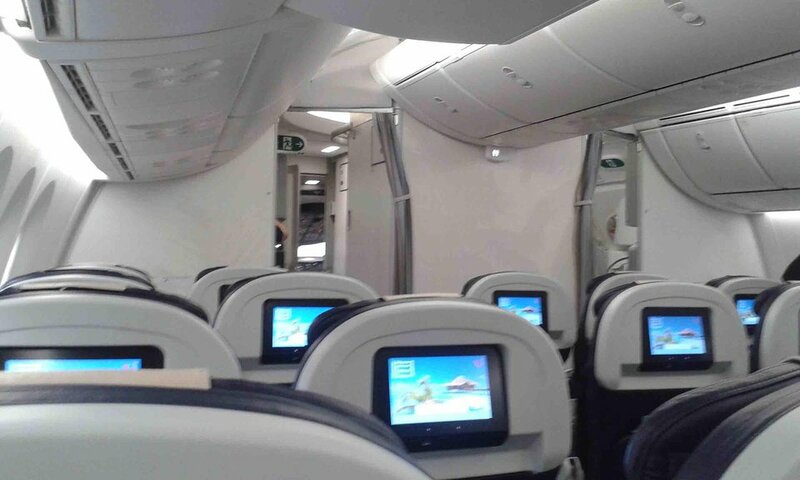 The passengers in front of us had their seats layed back during the entire flight. Had to crawl over the seats to go to the restroom. There was almost no AC durung the entire 9 hour flight. Alsi, no hydration unless you payed 3.50. Trying to upgrade for flight back but have to call Spain to do so. Rediculous. Small and uncomfortable seat for a four hour flight. No space for long legs. I had back ache after the flight. It's not worth it to pay an extra  42,50 (incl. cc charge) per leg an person for row 2E-F. No free middle seat is provided and the extra legroom to the front wall is quite a joke. I had an unacceptable cold air flow onto my face that could not be reduced. Seats in row 16 are at the emergency exit. They have extra legroom (for which you have to pay an extra fee) and are worth this fee. Like all other seats, however, they are very thin und practically not chushioned. The seatback offers no support for the spine, the seating aerea is too short, and in result you are not really sitting, but more or less cowering. For a flight of one or one and a half hour this is bearable, for longer flights, to the Canary Island, for example, I can not recommend this airline. Nice plane in with a special 'Haribo Goldbär' paintwork and the new 'sky interior' and whith splitted winglets. Seat was great, huge distrance to the seat infront and very comfortable for an economy seat.Service is ok, but you have to pay for everything if you've booked over the website of tuifly. Overall a pleasant flight. 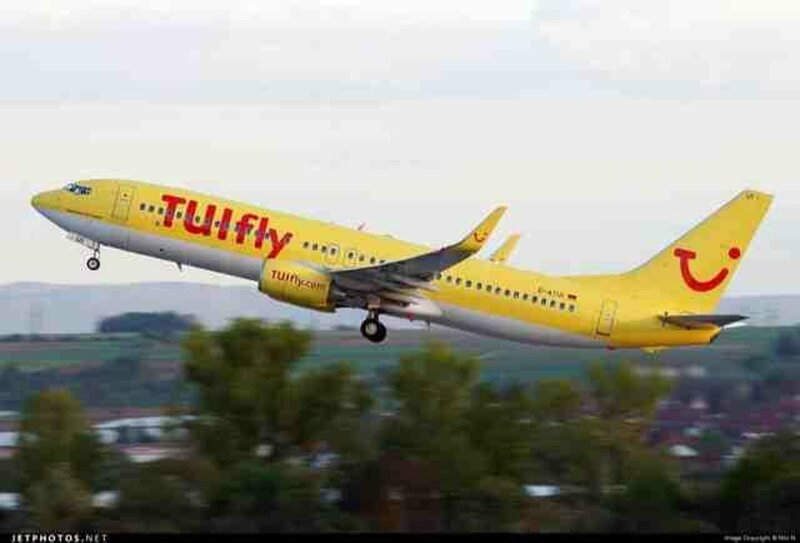 TUIfly flies 1 versions of Boeing 737-800.